Slip our patented snug and stretchy glove on your finger and turn it into a professional tool. The powerful magnet at your fingertip allows you to hold and retrieve any small metal object with precise control. Use it to quickly and easily start a variety of ferrous fasteners in tight-fitting or difficult to reach places. At work. At home. Anytime your finger needs a magnetic grip. Just slip our Magnetic Finger over your index finger and when you have the metal object on your fingertip use your thumb and middle finger to manipulate it when needed. Everyone can use it, comes in two sizes for large and small hands. For heavier uses try our Heavyweight version and the stay-in-place Industrial version with wristband. 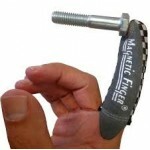 Magnetic Finger has many uses at home and on the job. 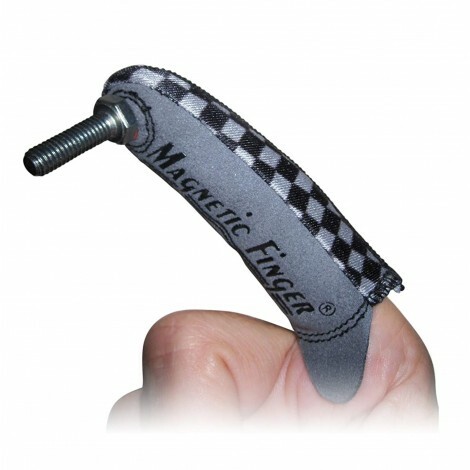 The Original Magnetic Finger is TurnPro’s first patent pending finger glove. It features a powerful magnet in the tip which allows you to hold and retrieve any small ferrous metal object with precise control. Ideal for tight-fitting and difficult to reach places. 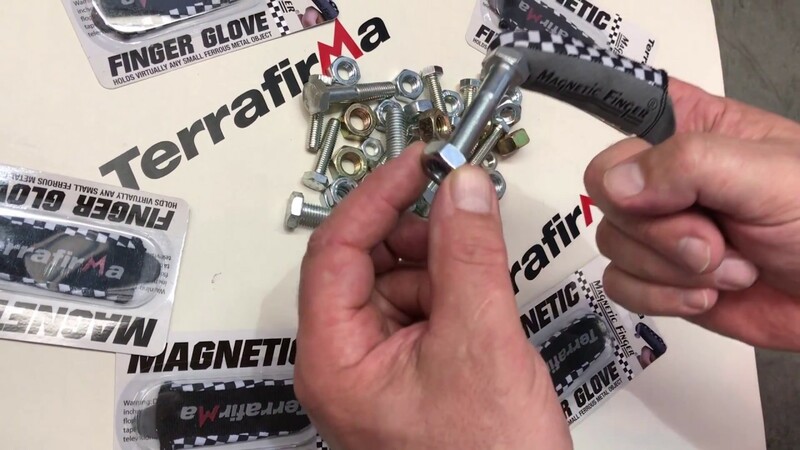 The “Original” provides the most dexterity since the magnet is positioned to allow the user to be able to manipulate the metal object they are holding easily with their thumb and middle finger. S/M is 3" x 1.125" & L/XL is 3.25" x 1.375"
polyester, nylon, spandex, lycra, and a disc magnet. The Frontal Assault Magnetic Finger is a variation of TurnPro’s original patent pending finger glove. It features the same powerful magnet in the front tip which allows you to hold and retrieve any small ferrous object with precise control. Ideal for tight-fitting and difficult to reach places. We brought this version out since there was a need for a Magnetic Finger that places the ferrous metal object directly out on the tip of the finger. This allows for the metal object to be placed in a tight spot that necessitates that the object goes directly forward. L/XL is 3.25" x 1.375"
The Industrial Magnetic Finger is TurnPro’s original patent pending finger glove with a wristband anchoring strap which provides the maximum security that certain jobs require.